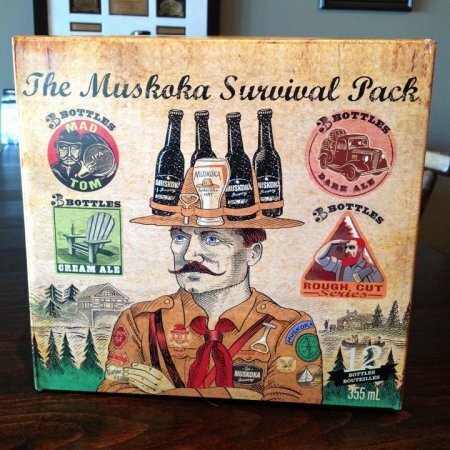 BRACEBRIDGE, ON – Muskoka Brewery has announced the upcoming release of The Muskoka Survival Pack, a new sampler pack that will feature three year-round brands as well as a rotating series of one-off beers. Set to be launched on June 1st, the 12 pack will include three bottles each of Muskoka’s Mad Tom IPA, Cream Ale and Dark Ale, along with installments in the new Rough Cut series, starting with a Kristallweizen in the first edition of the pack. The Muskoka Survival Pack will retail for $25.95, and will be available starting June 1st at select Beer Store outlets throughout Ontario and at the Muskoka retail store in Bracebridge. That is really f’n pricey. How so? Most local craft beers in Ontario are selling for $12-$14 a six pack and $24-$26 a 12 pack. This is right in line with that pricing, even with the inclusion of a one-off beer that is likely more expensive to produce than the year-round products.